Napolitano Roofing strives to offer customers as many professional services as possible when it comes to residential projects. We make sure our contractors are always up to date on the most reliable construction and roofing techniques and practices. Moreover, we want to be your one-stop-shop for all your exterior remodeling needs, which is why we offer more value with our other services. 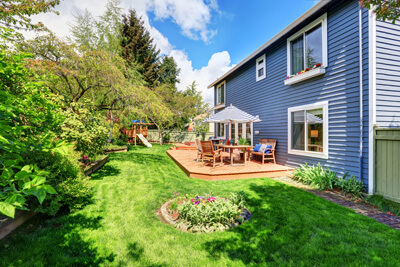 Choosing to wrap your home with beautiful, durable, maintenance-free siding from Napolitano Roofing is one of the smartest investments you can make. New siding will provide you with a long list of benefits. Should you choose to sell your home, having energy-efficient siding is an immediate bonus for potential buyers.We have the practical know-how and experience to make your home look great while protecting it from the elements, and saving you money in the process! At Napolitano Roofing, we install only the highest quality siding available, using installation techniques that have been honed through factory training and on the job experience. Beyond the added options for outdoor expansion, entertainment, and aesthetics that a new deck typically provides, it can also add superb value to a property. We can design and build a custom deck or patio that fits seamlessly with the architectural style and décor of your home.With this service, you’ll be able to enjoy more time outdoors, unwinding after a long day and just taking in the sights of your beautiful surroundings. Add a deck overhang and you can spend even more time outdoors, regardless of the weather condition. Here at Napolitano Roofing, we have developed a reputation for being the roofing company that homeowners in the suburbs of Connecticut can trust for their exterior projects. Give us a call at (860) 519-4900 for a free estimate. You can also reach us by filling out our contact form, and we’ll get back to you shortly.